Triple filtered water, organic beef bones, organic onion, organic apple cider vinegar, organic garlic, Selina brand Celtic sea salt, organic parsley. Each pack contains 24 fl oz (3 servings of 8 fl oz each). We searched far and wide for the ideal organic beef bone broth. One made following Weston A. Price’s recommended methods, and loaded with nutrients, but also rich in flavor. And we found it. Our beef bone broth is a slow-simmered blend of health-giving organic onions, organic garlic, organic parsley, organic apple cider vinegar and organic grass-fed beef bones. You’ve probably heard about how nutritious beef bone broth is, and how it fights inflammation, fends off infections, strengthens your hair and nails, and gives you a little extra pep in your step. Our organic beef bone broth is made following traditional methods, to make sure you get the most out of bone broth’s health benefits. Here’s how we do it. The beef bones are cooked gently for 48 hours with organic onions, organic garlic, and mineral-rich Celtic sea salt in fluoride-free triple-filtered water. Organic apple cider vinegar is added to pull nutrients from the bones into the broth. Finally, organic parsley is added for added nutrition and flavor. The result is a homestyle organic beef broth that’s rich in flavor and deeply nourishing. That’s it! Real bone broth - the way it's been made for centuries. This delicious bone broth is the perfect base for soups, casseroles, and sauces - it's easy to store in your freezer and ready to use. Drink instead of your morning coffee or tea, or to warm up on a chilly afternoon. No need shop for ingredients, leave the broth simmering all day, or to clean up afterwards - an excellent choice for those who want the benefits of bone broth, but are short on time. Order in bulk to share with family and friends, and keep a little extra on hand for holidays and special occasions. Each pouch of our scrumptious bone broth contains 24 fl oz (3 servings of 8 fl oz each). "In order to deliver Organic Bone Broth to you we must pay meticulous attention to the ingredients we use. We start with ... Grass-fed Organic Beef and triple filtered water. We add organic apple cider vinegar to pull the vitamins and minerals from the bones into the stock. We use the finest Celtic Sea salt on the market ... with over 80 naturally occurring minerals in the salt... Each batch is handcrafted in small batches. Real bone broth the way it has been made for centuries. And now, you can have this nourishing broth delivered to your front door..."
ARE THE BONE BROTHS ORGANIC, GRASS FED AND GRASS FINISHED? The organic beef bone broth comes from cows that have only grazed on grasses. The organic chicken and turkey bone broths come from organic pasture raised chickens and turkeys that are free to scavenge. They may also be supplemented with organic soy free feed. All of these broths are certified organic. The Frontier Blend is made with the organic beef and turkey broths described above, plus broths made from pastured lamb and pastured bison bones (these are pastured but not certified organic). WHICH HAS THE MOST NUTRIENTS, BEEF OR CHICKEN BONE BROTH? From everything we’ve read there are only small differences between them. They both provide the minerals from the bones. They both have collagen/gelatin. One difference is the type of bone marrow; chicken is more red marrow, while beef is more yellow marrow. Here’s an article that you may enjoy reading on the gelatin in bone broth. HOW MUCH COLLAGEN/GELATIN IS IN THE BROTH? The chicken bone broth is made with cartilage rich bones and chicken feet, which are known for being high in collagen. The beef bone broth is made with cartilage-rich knuckle bones and marrow bones, both providing plentiful amounts of collagen. Whatever collagen is in and on the bones is transferred to the liquid with a long simmer time. The broth may be somewhat thicker or somewhat thinner, depending on slight variations with each batch. WHY NOT USE POWDERED COLLAGEN INSTEAD OF BONE BROTH? ISN’T IT THE SAME? Collagen and gelatin powders are made from the hide of the animal, not the bones. Although these products contains protein, amino acids, and collagen/gelatin, they don’t provide the minerals in bones. Many of our customers add collagen or gelatin to their daily mug of bone broth simply to augment the collagen. I SEE THE BROTH IS PACKAGED IN PLASTIC. WHAT ABOUT BPA? The broth is cooked, stirred and packaged with stainless steel. The bone broth is cooled to 40 degrees before being packaged in resealable BPA-free and EA-free (Estrogen Activity free) plastic bags. It is then immediately frozen using proprietary methods to preserve freshness. HOW IS YOUR BONE BROTH DIFFERENT THAN THE BOXES OF BROTH AT THE STORE? Shelf stable containers are composed of three layers: polyethylene, aluminum and paperboard treated with polymers. To make their packaging sterile they spray or apply Hydrogen Peroxide and high heat to the packaging, and potentially irradiate it with Ultraviolet Light. The other issue with this method of packaging food is that the food itself must be exposed to high heat, or ultra-pasteurization - a practice that some say may interfere with important nutrients in the foods. In order to make it shelf stable for many months, it is usually aseptically processed, which flash-heats the broth in its boxed carton up to 295°, making it virtually sterile. Because of our concerns about heavy metal toxicity (aluminum) and PET being exposed to high-heat pasteurization or packaging, we choose not to make our broth shelf-stable. We believe that animal products should be kept refrigerated or frozen. Just as you wouldn’t find chicken feet, or chicken breast, or beef ribs on a shelf (unless they are overly processed, pickled or cured), you shouldn’t find bone broth on a shelf either. We add absolutely zero stabilizers, preservatives or flavorings to increase the shelf life of our product. We freeze it to maintain freshness without compromising our production or ingredients. IS THE BONE BROTH GLUTEN FREE? Yes! The bone broth is gluten free. It’s also MSG free. The bone broth is also Paleo friendly, GAPS friendly, and Whole30 approved. I JUST GOT MY BONE BROTH, BUT I'M NOT SURE HOW TO USE IT. Many of our customers drink a cup of bone broth once or twice a day. Both chicken bone broth and beef bone broth make a delightful hot beverage to enjoy with a meal, between meals, at bedtime or anytime! Organic bone broth is also quite versatile to use in cooking. Simply replace all or part of the liquid with chicken or beef broth when cooking soups, stews, beans, legumes, veggies, and casseroles. Not only does it increase the nutrients of the meal, but adds a rich depth of flavor. DO I NEED TO DILUTE THE BROTH? No need to add water to the broth. It is ready to thaw, heat and eat. WHY DOES THE PACKAGE SAY NOT TO MICROWAVE THE BONE BROTH? Microwaving food in plastic has been shown to transfer toxins into the food. But beyond that there have been reports that suggest microwaving can distort and deform the molecules in foods. The bone broth is an artisanal food, carefully made by hand with organic ingredients and bones from pastured animals. Much care is taken that the broth we offer has been properly prepared. The chicken bone broth is lightly simmered for 24 hours and beef bone broth for 48 hours - all to extract the minerals, collagen, amino acids, etc. providing you a most nutrient dense and flavorful broth. So although you could use a microwave to heat it, we suggest not to. Heating bone broth on the stove top is almost as fast and easy as using a microwave. Simply pour the broth into a saucepan and turn the stove on to medium heat until it steams. Pour into a cup or mug and enjoy! HOW DO YOU DEFROST THE BONE BROTH? There are several methods to thaw a bag of bone broth. You can set the unopened bag in a bowl to catch the condensation, and put in the refrigerator for 24 to 48 hours. You can also set the unopened bag in a bowl and leave it at room temperature for an hour or so to get the process started, then transfer to the refrigerator. The quickest way is to set the unopened bag in a bowl or pan of lukewarm water for 20-30 minutes. Refresh the warm water and repeat until it is thawed. If you only need one serving it’s not necessary to thaw the entire bag. HOW MANY BAGS OF BONE BROTH DO I NEED FOR 1 CUP A DAY FOR A MONTH? Each package is 24oz (three 1 cup servings). The 12 pack would be enough for 36 days. This will give you a little extra to use in recipes. There are some great recipes here. HOW MUCH FREEZER ROOM DO I NEED? 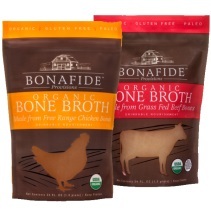 The chicken bone broth and beef bone broth are packaged in BPA-free and EA-free plastic resealable stand up bags. The bone broth bags are approximately: 8 1/2" high x 6" wide x 4" at the base. HOW LONG CAN I KEEP THEM IN THE FREEZER? WHAT ABOUT IN THE REFRIGERATOR? The organic bone broth can be kept in the freezer for 6 to 9 months, according to production date, when freezer temperature is set at zero or below. Once thawed the broth should be consumed within 7 days. If you need to, you can extend the days by only partially defrost to the point of still somewhat frozen or slushy. MY BROTH ARRIVED LATE AND IS PARTIALLY THAWED. IS IT OKAY TO REFREEZE THEM? On occasion the carrier may have a weather related or other delay. 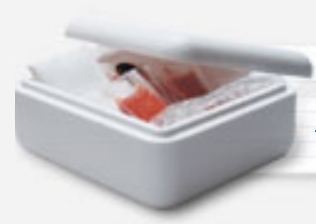 The insulated container and dry ice will usually keep your food frozen for several additional days. 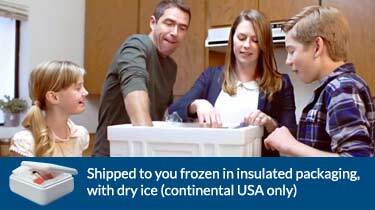 For a longer delay, if they arrive slushy or at least refrigerator cold, they may be refrozen. Refrigerated: Up to 7 days. Frozen: Approximately 6 months. Resealable, BPA-free stand-up bags, great for storing in the freezer.